What Is A Staging Area and How Important Is It To Your Site? If you run a wordpress blog, you might probably encounter the term “Staging Area” sooner or later. But what is a Staging Area actually, and how important is a staging area for your WordPress site? Basically, a Staging area is a place where you can create a copy of your site or take a snapshot of your blog, and place it in another location (“staging area”) where you can make changes, test some things without affecting your live site. This is one of the top features that a managed WordPress hosting company, like WP Engine, has. A Staging Area is probably one of the must have feature from a web hosting company. Before, I used to have problems on how can I test a particular wordpress theme or a plugin or do some customization to my blog without affecting the live site. It was really a problem and I could not afford my site to go offline or display a “website under construction” sign. But after I moved my site to WP Engine, I have been using their Staging Area feature to freely manipulate / change / or edit my site without affecting the live site. And when I’m done with editing, I can simply make the “edited” or “updated” look of my site, from the staging area, to go live. To give you an idea how WP Engine’s staging area work, simply go to WP Engine Settings menu via the tab located at the top left side of your dashboard. Go to the Staging tab and just hit the “Copy site from LIVE to STAGING“. It automatically creates a duplicate of your current live site. Once the staging area is prepared, you can simply access your “duplicate” blog via http://mywordpresssite.staging.wpengine.com/wp-admin. You can do anything on the site within the staging area just like in a live site, except that only you can view the site. Once you have finished doing the changes to your blog that is currently within the staging area, you can simply ask WP Engine tech support to make it live for you. By now, you probably have an idea on how important a Staging Area is, for your WordPress site. No more “site under construction” days or “site under maintenance”. Your visitors can still visit your blog without knowing that you are cooking something great under its hood. 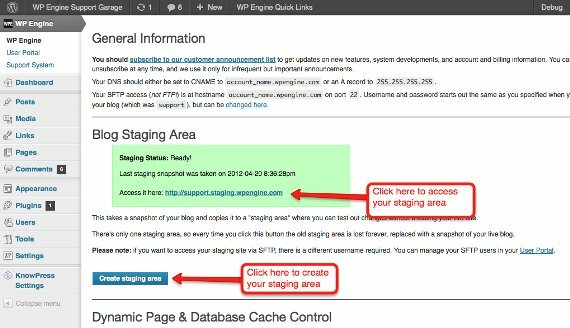 Again, Staging Area is one of WP Engine’s top features, aside from making your site go fast and secure. To learn more on how you can take advantage of this feature for your site, visit their page here. You might also want to check out my review on WP Engine managed WordPress hosting.